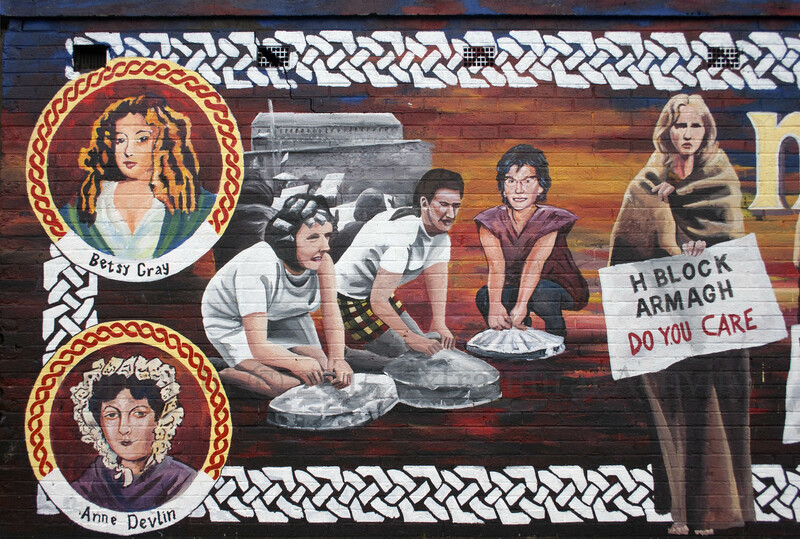 Here are two final images of the extremes of the Mná na hÉireann mural featured on Monday and Wednesday. In the four corners are circles of Betsy Gray, Anne Devlin, Mary Ann McCracken, and Máire Drumm. Gray and McCracken were Presbyterians; Gray fought (or at least, was killed) in the 1798 rebellion, as did McCracken’s brother Henry Joy; Mary Ann went on to work for the poor of Belfast and lobby against slavery. Anne Devlin assisted in Robert Emmet’s 1803 rising. (National Graves Assoc) Máire Drumm was vice-president of Sinn Féin and commander of Cumann na mBan, who are shown marching on the right-hand side. In the cloth cap and holding a rifle is Eithne Coyle, a leader and later president of Cumann na mBan, imprisoned both by the Black and Tans before the treaty and after it by the Provisional Irish government. 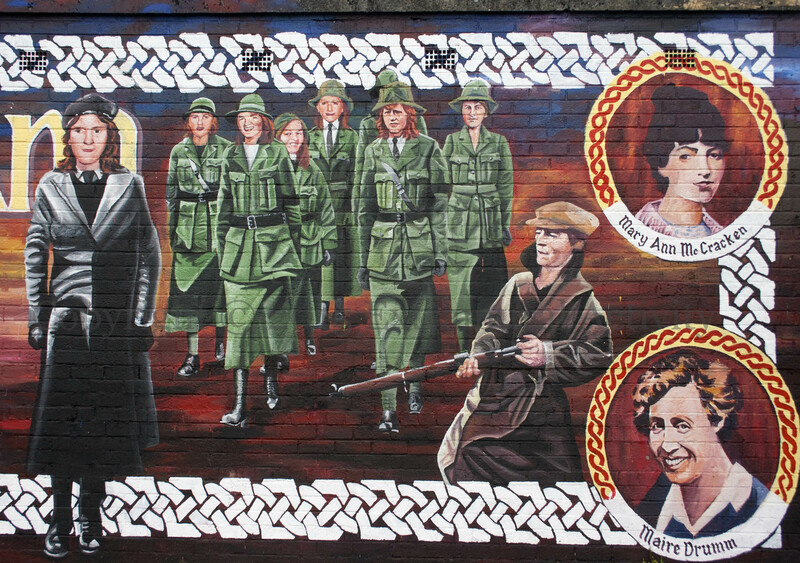 (WP) For the photograph on which her pose here is based, see An Phoblacht‘s History Of Cumann na mBan, which also includes the photo of marching women (discussed previously in Mothering Sunday In Beechmount) though the faces have been changed here, presumably to those of more contemporary volunteers. The same is probably true of the third woman with a bin lids on the left – leave a comment or send an e-mail if you can put a name to any of these faces. Previous Article Do You Care?